Our most disappointing and overpriced meal this year was at Holbeck Ghyll in Cumbria, during a week in the Lakes. I can’t even begin to imagine how it merits a Michelin star, but can only guess that standards have dropped sharply since it was sold in January this year. I’ll be gobsmacked if it retains its star in 2011, based on our meal there at the end of July. 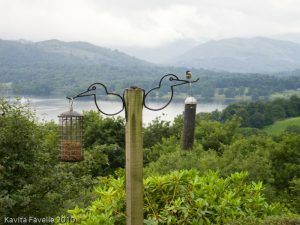 The setting is lovely, in a 19th century hunting lodge with fabulous views down to Lake Windermere. The lodge is now an upmarket hotel with onsite restaurant. 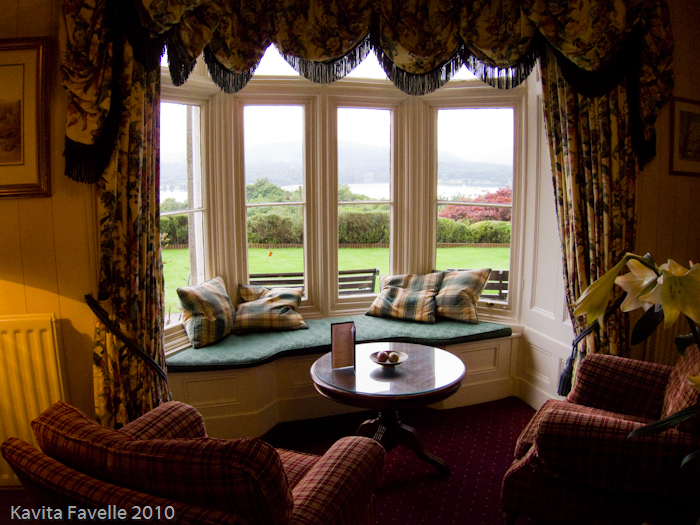 We were shown into a sitting room on arrival, with wonderful views, and given the menu and canapés. They were alright, not as tasty as they were looked, but nothing glaringly wrong either. After making our meal choices, we were eventually shown into the dining room. It felt dreadfully dated (not in a gorgeous historic way) and the motel style carpet did not help to bring out the potential appeal of the wooden panelling. Still, the menu sounded good and we looked forward to the meal. 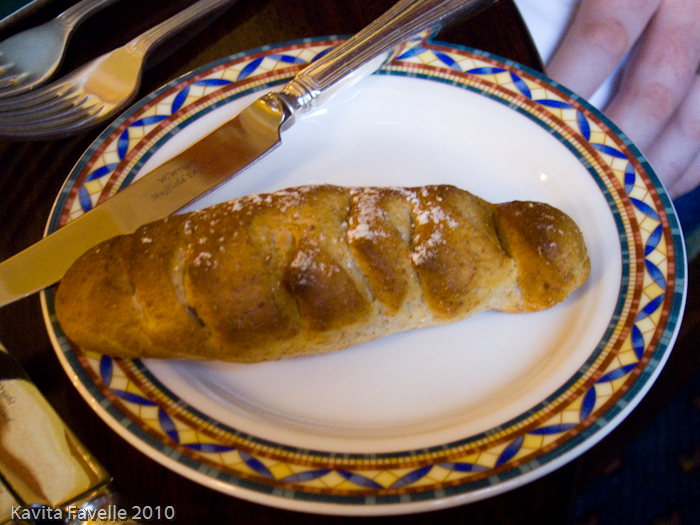 Butter was beautifully presented on a slate, with sea salt crystals but the bread was so-so. Next came an amuse bouche of foamy soup in a small coffee cup. I didn’t make a note of what vegetable it was but remember finding it pleasant, though a little plain. The green herb oil in it was pretty but I couldn’t make out the flavour of it. 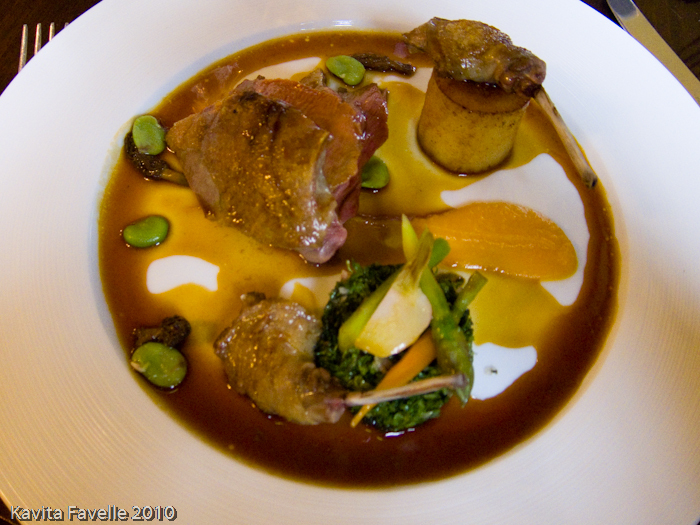 I chose the salad of warm Perigord quail with white grape and Sauternes dressing. This was a pleasant dish, nicely presented and with some decent, rich flavours. A good starter. 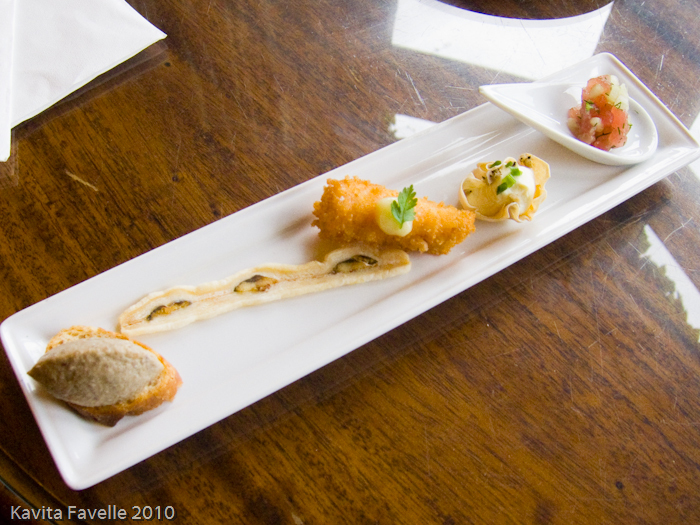 Pete selected the rillette of rabbit with crostini and truffle cream vinaigrette. 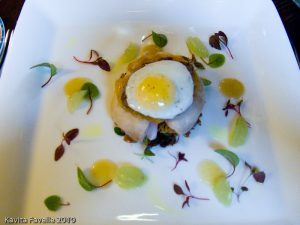 Presentation was the best thing about this dish – it looked very pretty. Taste-wise it was alright, though not as rich as expected. The texture of the filling within the cylinders was also much more mousse-like than rillettes as we’ve had them before. For my main I had the best end of Cumbrian lamb in herb crumb with girolles, shallot purée and rosemary juice. All I can tell you is that if this was the best of the poor lamb, I’d not want to taste it’s worst. It’s seriously hard work to lose the distinct sweet flavour of good lamb, especially well-reared British lamb from Cumbria. Whilst the meat was cooked properly pink and was fairly tender, the lack of flavour was a huge disappointment. The girolles were few and far between and gritty to boot. The vegetables were probably the best things on the plate. Pete, a fan of game, ordered the roast loin of Lakeland venison with herb spätzle. This was another disappointment. Again, whilst the texture of the meat was OK the all-important flavour was lacking. How had they managed to make venison taste of so little? Worst of all were the deformed and rubbery little pellets they passed off as spätzle – they bore no relation to the solid but moreish egg noodles we’ve enjoyed in Germany. Spätzle should not be rubbery! The sauce they were drowned in tasted good though! Since the price of the meal was £56.50 for three courses, we figured we might as well order desserts, since we’d be paying for them anyway. I chose the chocolate soufflé, delice, tart and orange sorbet. Anyone who knows me knows how much I love chocolate. And a good dessert can make me forgive a lot in the dishes preceding. But the collection of miniature offerings was so poor I left most of it. I love dark chocolate and can take it pretty bitter but the tart was so bitter it was, for me, inedible. The layered concoction in the glass was, on the other hand, sickly sweet and tasted like the cheap pudding mixes of yesteryear. The soufflé was OK, though only OK. I can’t even remember the circle of mousse at the top left. 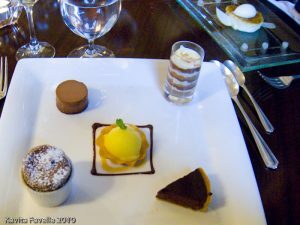 The best thing on the plate was the orange sorbet – ironic for a plate all about chocolate. I really can’t remember when I last had a more disappointing dessert and, gosh they had 5 little chances to impress me right there! 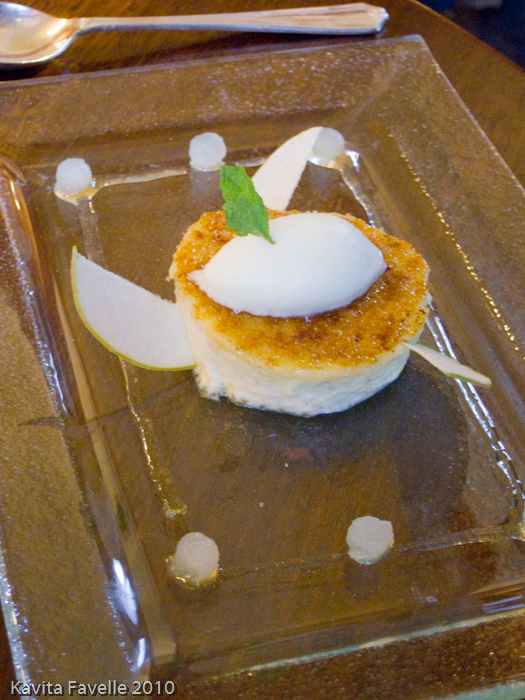 Pete went for the crème brûlée with apple sorbet, poached apple and cider sauce. He loves crème brûlée and though he loves a good one, he’s fairly forgiving. 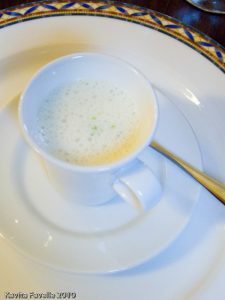 But the texture of the crème was strangely spongey and we both only realised on eating it how unpleasant acidic apple and eggy creams can be together – in this incarnation at least. Another fail! 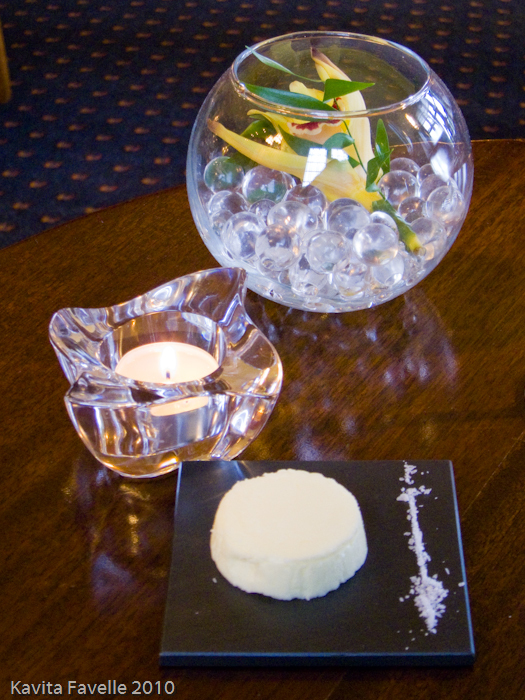 If the food wasn’t disappointing enough, one of the bugbears we had during the evening was the standard of service. Whilst no-one was rude or grumpy, the service was sloppy and casual and there seemed a distinct lack of training. Some plates were virtually thrown down in front of diners (not with any sulkiness attached, just lack of care and attention) leading to sauces slopping over the lips of the plates. Some staff didn’t seem to know who at a table had ordered which dish and had to ask (though this depended on who was serving the table). 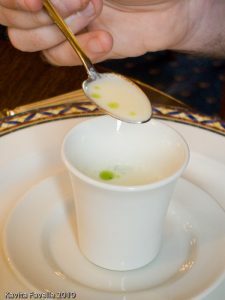 There seemed to be only one member of staff who had any inkling about formal service standards and he seemed to be assigned to plate clearing duties, though we often saw him take the initiative to assist a diner with something else when he spotted that none of his colleagues had picked up on it. This standard of service might be OK in a less formal, less expensive restaurant (after all, we got what we ordered, in the right order, and our water was replenished reasonably regularly) but for an establishment charging these prices, and trumpeting it’s Michelin star so proudly on its website, it wasn’t remotely good enough. 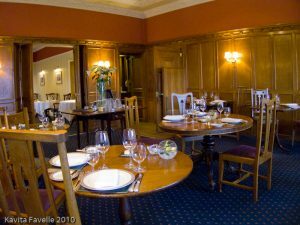 When one couple politely complained that they were too hot, as the radiator by their table was switched on (it was very warm and had been all day) they were told it wasn’t possible to turn it off. But no one offered to move them even though they hadn’t yet started their meal and there were several other suitable tables available and set, none of which were occupied by other diners during the evening. It was so warm that, even sat at the other side of the room from this radiator, I felt like I was having a hot flush and in the end, having also mentioned the heat to members of staff to be answered with a shrugged apology, I took matters into my own hands and opened the French doors behind us. As I started to do so, finally a member of staff offered to help me. There was an audible gasp of relief around the other few diners in the room as a cooling breeze wafted in. There didn’t seem to be anyone managing the team nor keeping an eye on service and issues. The one person we initially thought might be the restaurant manager seemed to be the sommelier. To be frank, no-one seemed to really care whether we were enjoying our meal, whether we needed anything or whether anything was wrong. 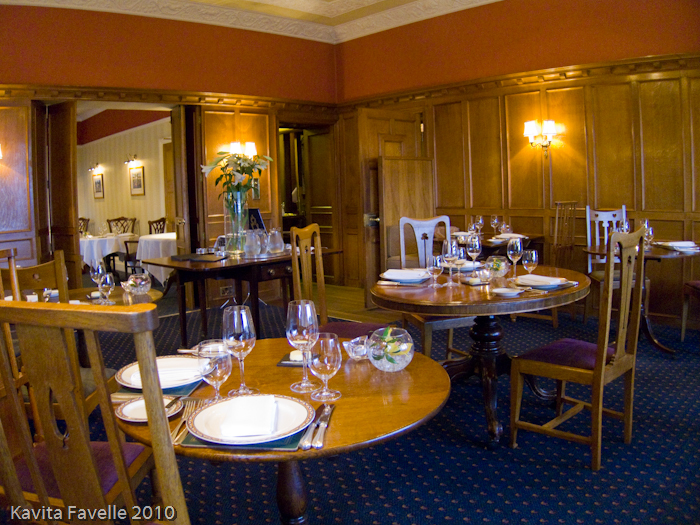 With food as above and one (inexpensive) glass of wine each, the bill came to £125.55 without service. As I waited outside for Pete to retrieve the car from their lower car park, I confess to asking myself why I added service at all but I didn’t want to blame the staff for what struck me as a lack of proper management and training. Thank goodness we didn’t opt for the £74/ head gourmet menu featuring many of the same dishes or I’d been even more upset. I’m curious about whether our experience was atypical (I’d like to think so given the glowing reviews that abound on the web) or whether standards have slipped since new ownership took over. 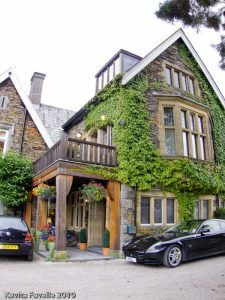 If you’ve eaten at Holbeck Ghyll recently, do please let me know how you found it. 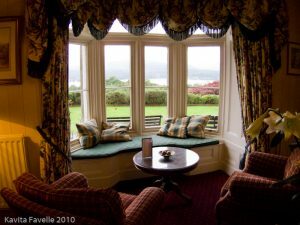 7 Comments to "Holbeck Ghyll: A Disappointment"
So sorry to read about your disappointment. We recently had an equally disappointing experience in a 1* in the Netherlands. 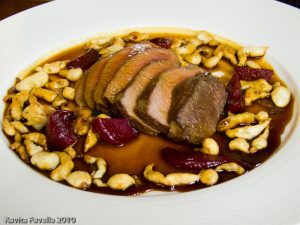 It was our first time in a Michelin starred restaurant, so we thought that, maybe, our expectations had been too high. After another experience in a 1* in Belgium, we were convinced that this was not the case. The Belgian 1* was just perfect and well worth the money. Sorry to hear about your disappointing * experience too. I agree, it's more a problem of inconsistency than expectations – I have visited a number of Michelin star places now and have loved some and understood why they are so lauded, and been completely confused by the inclusion by Michelin of others. There's another post going live tomorrow about a * restaurant we really enjoyed, though it was a review visit so they did know we were coming. Still, we could see and hear other guests talking about the food and they seemed equally impressed! That's really disappointing.Even if the place has been sold there's no reason to expect that the service standards should have fallen so quickly.I remember reading that the hotel had been bought by a businessman with no background in hospitality.Its not easy running somewhere like this, it sounds as if there is no one at the helm. As you said there is some wonderful lamb available in Cumbria how odd that they served an inferior dish.I too love Creme Brulee-I made some recently with apple and it actually works really well if done properly.It sounds as if they aren't tasting anything.Not good when they are charging those prices. I hope you managed to find some good food elsewhere on your trip north! NS, yeah I'd like to think we went on an off night but… I don't know. Maybe they lost key staff following the takeover – sometimes we forget that an entire operation can hinge on a few brilliant staff pulling everyone else together and bringing the best out of the entire team. Sorry you did not enjoy your visit in July. I took over on 1st August and have revisited the menu, purchased new chairs, Axminster carpet and hand made light fittings, new crockery and kitchen equipment as well as undertaking ongoing staff training. All guest feedback is taken seriously so please contact me at the hotel to discuss these changes and your posts. It is only fair to allow your readers to be kept informed. I look forward to your call. Andrew McPherson. We also felt the meal here did not match the standard of other 1* restaurants we have dined in. Starters & desserts OK but nothing special. 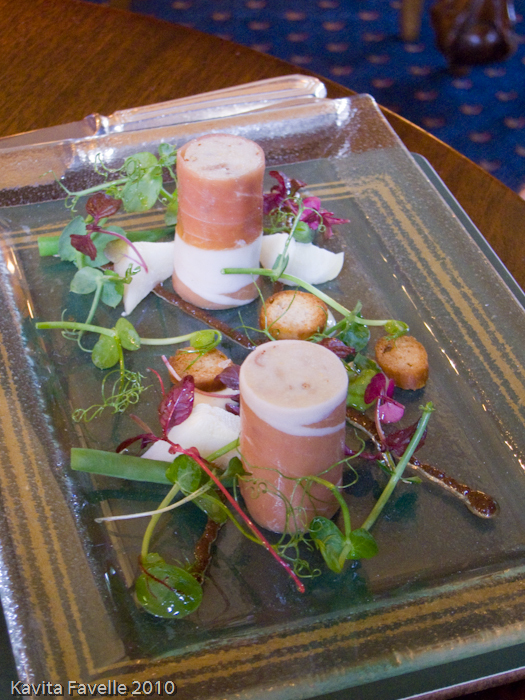 My husband's hot starter arrived but we waited for mine(cold) to appear – which it did several minutes later! Surely staff could be trained to carry 2 plates or use a tray. We both had the turbot main course but felt the nice (tho' small) pieces of fish were not enhanced by the red wine poaching & strong sauce. Main course portions were similar to those served at lunch in other 1* establishments. I hope the promised new chairs (18 Oct post) were not the ones we sat on – so uncomfortable I had to use a cushion! Not something I've had to do before in such an upmarket restaurant/ hotel.On this form & at this price I wouldn't recommend it especially as we had other issues with the hotel aspect. your account makes me glad we did lunch and not dinner. 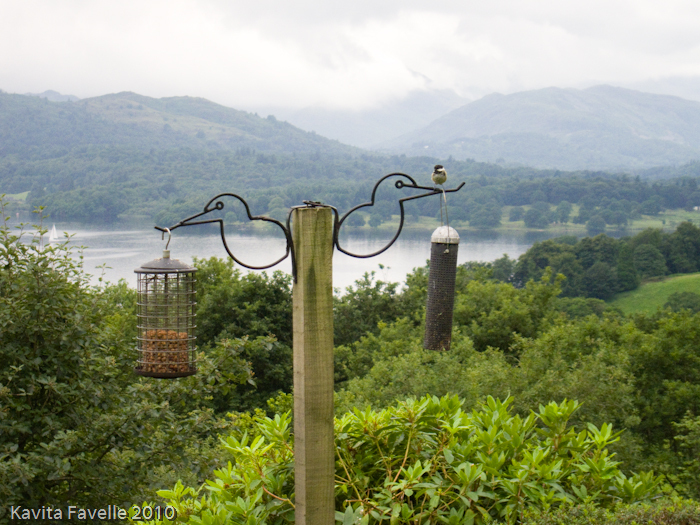 although the food wasn't amazing, at £29.95 for 3 courses it wasn't quite so painful… and I did like the view! But no, not really 1* material.